Dr Sally Pezaro | This is the research blog of Dr Sally Pezaro. Sally is 'The Academic Midwife' working to secure excellence in teaching and maternity services. Specialist interests include maternity services, workforce and midwifery research. I was honored to be an invited speaker to the GOLD online Midwifery conference this February (2019). It was wonderful to present our latest findings to an international audience, and I always prefer to do things online, from the comfort of my own office. 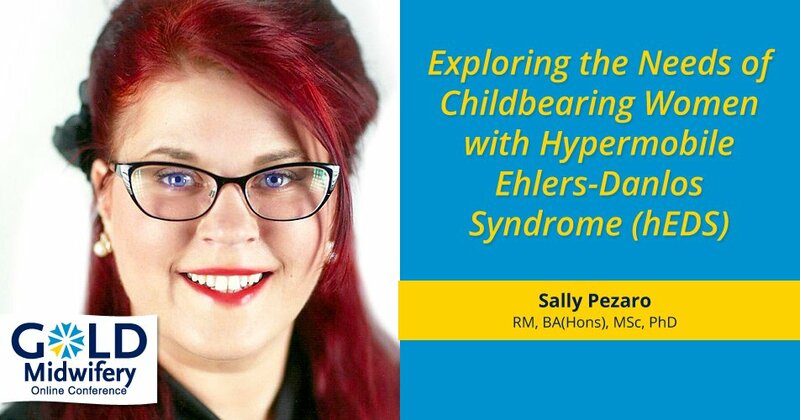 The team at GOLD midwifery were very supportive throughout my experience with them, and invited me to join in a podcast interview on my chosen topic..
‘Exploring the needs of childbearing women with Hypermobile Ehlers-Danlos Syndrome (hEDS)’ – You can access this via the video below. The audience were very active in participation, and it was interesting to see how the live polls throughout my live presentation were completed. We had midwives join from all over the world! Some had heard of hEDS, and some had not. Yet everyone was keen to learn more. This conference also enabled me to introduce my colleagues via video. I will introduce you to them here again now via the two following videos. By far the most engaging part of my presentation (as told to me by delegate feedback) were the videos which demonstrated what hyperextensible skin looks like, and how to use the Beighton score to test someone for hypermobility. As such, I will share these videos here too. I would love to know what you think of them. Whilst these explanatory videos were indeed fab, I was also able to share some of our new findings in relation to women’s childbearing experiences with hEDS. The 40 interviews we carried out during this project gave us a much deeper understanding of the issues these childbearing women face. At times they are not believed, belittled and/or accused. Other times, their experience of trauma means that they are not willing to bare any further children. Our findings as a whole are concerning, and we hope to publish and share them soon, so that we can start making quality and safety improvement plans in partnership with key stakeholders. It is wonderful to know that delegates at this conference were enthusiastic about following our research going forward. This experience has definitely affirmed to me that midwives around the world are thirsty for new knowledge and ways to improve their practice. Thank you to the delegates and organizers of the GOLD Online Midwifery Conference logging in from over 50 countries!!! It was wonderful to say goodbye at the closing ceremony too. Thank you for inviting me! I think this is the beginning of a really special journey. THE VOTES ARE IN! What do the results tell us about future research on childbearing with hypermobile Ehlers-Danlos syndrome? We asked the public to complete three short polls to inform the design of future research on childbearing with hypermobile Ehlers-Danlos syndrome (hEDS) and Hypermobility Spectrum Disorders (HSD)…These polls received over 4000 votes!.. THANK YOU!!! What complications should we ask childbearing women with hEDS/HSD about? Listening and supporting any knock on affect and recovery etc. Which tools would be most useful in helping maternity staff support childbearing women with hEDS/HSD? Patient stories; mythbuster facts: too many tacit assumptions in healthcare! Please look at online communities formed around nerve injuries in childbirth. Staff have a lecture from you to educate them! RCOG greentop guidelines on EDS would be amaze-balls! What should we ask maternity staff about hEDS/HSD in the context of childbearing? Incentive to learn – perhaps a way to earn more if they complete a course? So how will we use this information? We will use your votes to ensure that the things that matter most to you are included within two international surveys. Once these surveys have been designed, we will be submitting our research plan to the ethics committee at Coventry University for approval. Once ethical approval has been granted, these surveys will be opening very soon to both maternity staff and those childbearing with hEDS/HSD. We hope that the results of these surveys will give us an overall picture in relation to how both maternity staff and childbearing women with hEDS/HSD may be better supported, so please do look out for them and share them where you can. Many thanks again for all of your responses and suggestions! 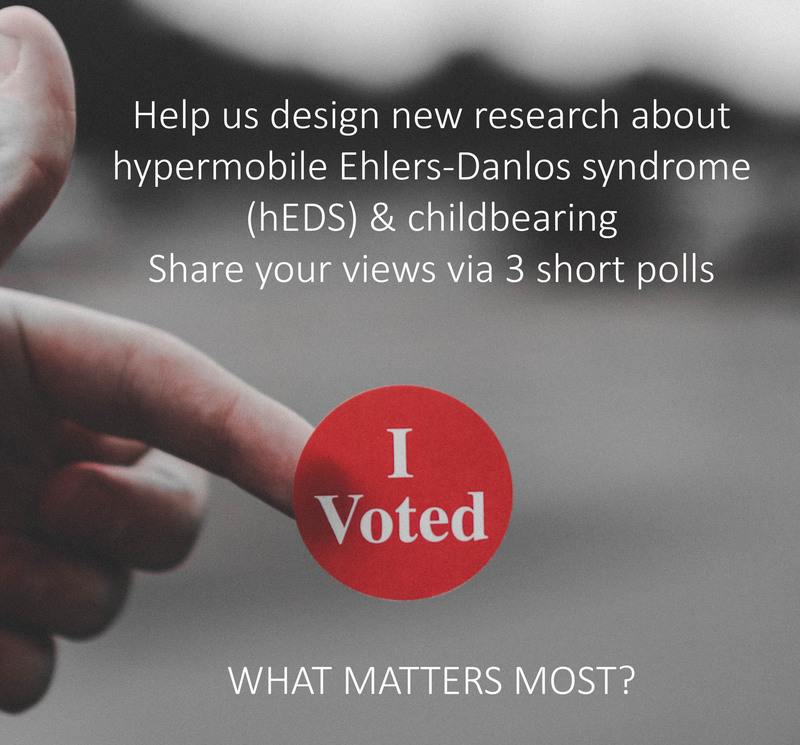 Have your say in designing future research on childbearing with hypermobile Ehlers-Danlos syndrome: VOTE NOW! 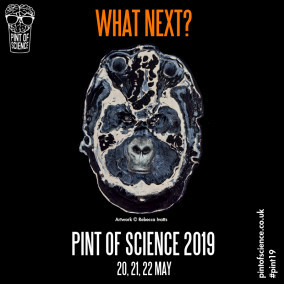 YOU CAN SEE THE RESULTS OF THEM HERE..
As you may or may not know, we (@GemmaSPearce , @DrEReinhold and I, @SallyPezaro) have recently won funding to do further research and professional & public engagement on the topic of #hypermobile #EhlersDanlosSyndrome & childbearing. We are currently designing how the two international surveys will look and what they will ask our participants about. Whilst we have largely relied on the current evidence base to develop the surveys so far, we would also like to involve YOU (the public) in telling us what topics we should prioritise. Many thanks for your responses and suggestions. Please share this blog post far and wide so that we can include as many voices as possible in the design of this work! We will be using all responses submitted before the end of the 24th of February 2019. We collected Tweets, emails, Facebook messages, feedback, download data and other testimonials to estimate the impact our work. The powerful magnitude of this impact data translated into us being awarded ‘Highly Commended’ status in the category of ‘Team Impact Commitment’ via ‘The Real Impact Awards’ hosted by @EmeraldGlobal. The Real Impact Awards celebrate the commitment to impact by the research community across the globe. Along with the many messages we received from midwives who felt that this paper had enabled them to improve their midwifery practice, the British Journal of Midwifery (@BJMidwifery) kindly made this article openly accessible, meaning that those outside of academic institutions could also use it to instigate change. Our article has been downloaded over 12,000 times so far. “…when the knowledge generated by our research contributes to, benefits and influences society, culture, our environment and the economy”. As a result of our impact activities, we have been able to secure several invited talks and an invited publication to update readers on the new evidence we have been pulling together. We have also won further funding to carry out more research, and I have received several nominations to become the British Journal of Midwifery’s Midwife of the year 2019… So watch this space, because we are working toward many more exciting things for the future. How does patient and public involvement work in research? An example exploring midwives’ workplace wellbeing. What are the perceptions of new mothers in relation to the barriers to receiving high quality maternity care? What are the perceptions of new mothers in relation to the psychological wellbeing of midwives working in maternity services? What are the perceptions of new mothers in relation to a research proposal outlining the development and evaluation of an online intervention designed to support midwives in work-related psychological distress? 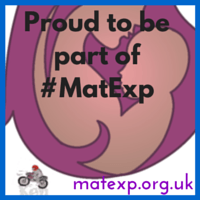 Improve upon the design of the proposed online intervention based on what really mattered to mothers and babies. Pezaro, Sally, Gemma Pearce, and Elizabeth Bailey. “Childbearing women’s experiences of midwives’ workplace distress: Patient and public involvement.” British Journal of Midwifery 26.10 (2018): 659-669. This article was launched in the October edition of the British Journal of Midwifery at the Royal College of Midwives annual conference in 2018 #RCMConf18. Put simply, the findings in relation to what participants said were analysed thematically and turned into meaningful insights or ‘PPI coutcomes’. In this sense, we used a co-design approach to inform the direction of new research. How did this work exactly? See figure below. A such, we could not include midwives in these PPI activities due to them have a ‘professional role in health and social care services’. Nevertheless, as midwives were the intended end users and direct beneficiary of the intervention proposed, we argued that they should “not necessarily be excluded from PPI activities simply because they treat patients”. This debate lends itself to further academic discussion and we welcome ideas on this going forward. Both national and international strategies and frameworks relating to healthcare services tend to focus on putting the care and safety of patients first , yet these findings suggest that to deliver the best care to new mothers effectively, the care of the midwife must equally be prioritised. As such, we now intend to seek further funding to continue this work and secure excellence in maternity care.